Stupid balloons always trying to destroy the universe. A few months after the browser version received the update, developer Ninja Kiwi has added 2 player co-op play to the iPhone and iPad versions of Bloons TD 5. Monkeys, balloons, darts, lots of pretty colors, and less embarrassment because you're playing it with a friend! While it plays like your usual tower defense game, Bloons TD 5 sports a lot of creative extras that make it both accessible and highly addictive. The co-op update allows two players to team up to defeat the relentless onslaught of bloon creeps across 12 custom-made multiplayer maps. Matchmaking allows for fast public games, but you can also create and join private games via Facebook integration. Ninja Kiwi's flagship tower defense game has grown a lot over the years. What started with a simple balloon-popping arcade game (well, "bloon" popping) turned into an entire franchise of browser games, capturing hundreds of thousands of players. 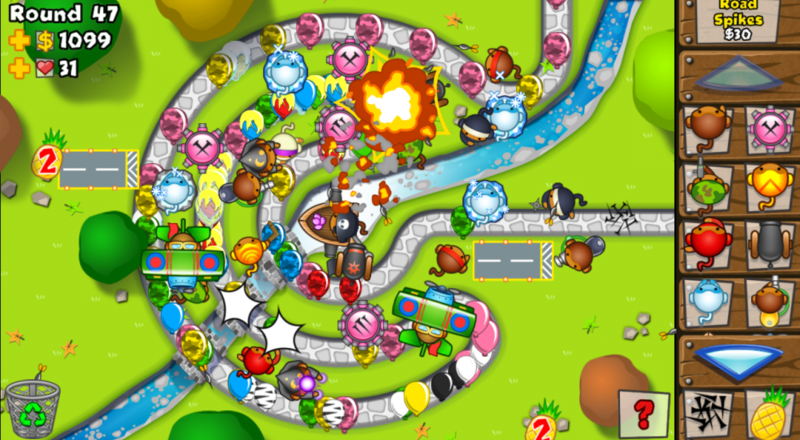 The fifth incarnation of the Bloons TD series has been the biggest yet, spawning copies on mobile devices in addition to its comfy browser home. The iOS version itself has been purchased over two million times. That's exactly two million more downloads than the unlicensed clone we're working on: PopBubble Building Protection Starring Monkii the Orangutan. Page created in 1.2842 seconds.